After a season that saw Notre Dame’s College Football Playoff hopes come unhinged by two losses by a combined four points, it was announced Sunday that the Irish will meet defending national champion No. 7 Ohio State in the BattleFrog Fiesta Bowl in Glendale, Arizona, on Jan. 1. “I won’t tell you that they were jumping up and down when the announcements were made today, because they were disappointed that they weren’t one of the four teams, but they also want to play one more game together, and this is that opportunity to play one more game together,” Irish head coach Brian Kelly said Sunday afternoon. Notre Dame (10-2) and Ohio State (11-1) will meet for the sixth time ever, with the Buckeyes leading the series 3-2, including a victory in the most recent matchup, a 34-20 victory in the 2006 Fiesta Bowl, Notre Dame’s last appearance in the game. Ohio State is led by junior running back Ezekiel Elliott and sophomore quarterback J.T. Barrett, the former a Heisman contender this year and the latter in the mix during the 2014 season. Kelly was effusive with his praise of the whole Buckeye team, however, including head coach Urban Meyer. With the selection, Kelly will have now taken teams to bowl games in each of his first six seasons, the first coach in Notre Dame history to accomplish such a feat. For Kelly and the Irish, the Fiesta Bowl will also present the opportunity to win a major bowl game for the first time in 22 years when Notre Dame edged Texas A&M, 24-21, in the 1994 Cotton Bowl on New Year’s Day. Preparation for the bowl game will have Notre Dame practicing until Dec. 23, with the schedule working around players’ final exams. The team will reconvene in Phoenix on Dec. 27 for a normal week of practice leading up to the game. Kelly provided updates on several injured Notre Dame players. As of Sunday afternoon, Kelly expects junior tight end Durham Smythe (shoulder, knee), senior defensive lineman Jarron Jones (knee), junior linebacker James Onwualu (knee), junior cornerback Devin Butler (head) and senior running back C.J. Prosise (ankle) to all be ready to face Ohio State come New Year’s Day, with Prosise being the only one of the group who is not yet fully cleared for Thursday’s practice. Senior running back C.J. 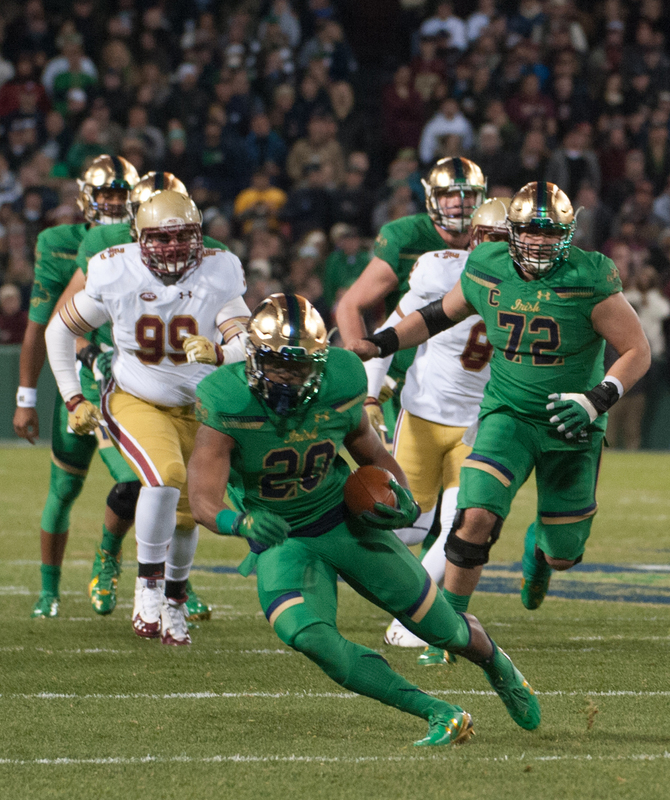 Prosise makes a cut during Notre Dame’s 19-16 victory over Boston College on Nov. 21 at Fenway Park. Prosise carried the ball for 54 yards on nine attempts during the game. Smythe and Jones will be making their return after starting the season at the top of the depth chart for the Irish but going down with injuries in the second game and during preseason camp, respectively. Kelly said he expects to get a solid level of play out of both despite all the time they have missed. Kelly also reiterated that senior cornerback KeiVarae Russell will not be available for the Fiesta Bowl as he recovers from a broken tibia suffered Nov. 21 during the Shamrock Series game against Boston College. Sunday’s press conference also turned to the state of Notre Dame’s roster next year, and whether or not a handful of key contributors will be on it. Kelly announced NFL Draft evaluations were requested for Russell, Prosise, senior offensive lineman Ronnie Stanley, junior receiver Will Fuller and junior linebacker Jaylon Smith, all of whom have eligibility remaining. Stanley and Smith are projected first-round draft picks by many pundits, while Fuller has previously stated he plans on returning for his senior season. Players can receive one of three grades from the NFL’s advisory committee: first round, second round or return to school.